The musical was premièred at the Theatre Royal, Drury Lane, London, on 20 September 1989, closing after 4,092 performances on 30 October 1999. It opened on Broadway at the Broadway Theatre on April 11, 1991, and subsequently played in many other cities and embarked on tours. Prior to the opening of the 2014 London revival, it was claimed that Miss Saigon had set a world record for opening day ticket sales, with sales in excess of £4m reported. The musical represented Schönberg and Boublil's second major success, following Les Misérables in 1985. As of April 2017, Miss Saigon remains Broadway's thirteenth longest-running show. The musical was inspired by a photograph, which Schönberg found inadvertently in a magazine. It showed a Vietnamese mother leaving her child at a departure gate at Tan Son Nhut Air Base to board an airplane headed for the United States where the child's father, an ex-GI, would be in a position to provide a much better life for the child. Schönberg considered this mother's actions for her child to be "The Ultimate Sacrifice," an idea central to the plot of Miss Saigon. Highlights of the show include the evacuation of the last Americans in Saigon from the Embassy roof by helicopter while a crowd of abandoned Vietnamese screams in despair, the victory parade of the new communist régime and the frenzied night club scene at the time of defeat. A week later, Thuy's soldiers find the Engineer somewhere up north. For the Communist Party, he goes by the name "Tran Van Dinh" and has spent the past three years working in the rice fields. The Engineer takes Thuy to where Kim has been hiding. Kim refuses Thuy's renewed offer of marriage, unaware that his men are waiting outside the door. Furious, Thuy calls them in and they begin tying up Kim and the Engineer, threatening to put them into a re-education camp. Kim introduces him to Tam, her three-year-old son from Chris. Thuy calls Kim a traitor and Tam an enemy, and tries to kill Tam with a knife, but Kim pulls out a gun and kills Thuy ("You Will Not Touch Him"). She flees with Tam ("This Is the Hour") and tells the Engineer what she has done ("If You Want to Die in Bed"). The Engineer refuses to help her until he learns that Tam's father is American ("Let Me See His Western Nose") – thinking the boy is his chance to emigrate to the United States. He tells Kim that now he is the boy's uncle, and he will lead them to Bangkok. The three set out on a ship with other refugees ("I'd Give My Life for You"). Tam – Kim and Chris's three-year-old son. He corresponds to Dolore, or "Sorrow". 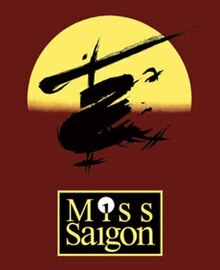 Miss Saigon premiered in the West End at the Theatre Royal, Drury Lane on 20 September 1989 and closed after 4,264 performances on 30 October 1999. The director was Nicholas Hytner with musical staging by Bob Avian and scenic design by John Napier. In December 1994 the London production became the Theatre Royal's (Drury Lane) longest running musical, eclipsing the record set by My Fair Lady. Lea Salonga played the part of Kim, winning the Laurence Olivier Award and Tony Award. The Engineer was originated by Jonathan Pryce, who also won the Laurence Olivier Award and Tony Award for the role. The part of Chris was originated by Simon Bowman. Preview performances for the anticipated West End revival in the show's 25th year began in early May 2014 at the Prince Edward Theatre. It was produced by Cameron Mackintosh and directed by Laurence Connor. Auditions for the role of Kim were held from November 19–22, 2012 in Manila, Philippines. On November 21, 2013, it was announced 17-year-old Eva Noblezada was cast as Kim. Other cast members included Kwang-Ho Hong as Thuy, Jon Jon Briones as the Engineer, Alistair Brammer as Chris, Hugh Maynard as John, Tamsin Carroll as Ellen and Rachelle Ann Go as Gigi. The official opening night was 21 May. On the 22nd September 2014, a special 25th anniversary gala performance was held. After a full performance of the current show, Lea Salonga, Simon Bowman, Jonathan Pryce and many of the original 1989 cast joined with the current cast for a special finale. The finale started with Lea Salonga leading the ensemble with "This is the Hour", Lea and Rachelle Anne Go performed "The Movie in My Mind". Lea, Simon Bowman, Alistair Brammer and Eva Noblezada performed "Last Night of the World" before Jonathan Pryce took to the stage for "The American Dream" and was later joined by Jon Jon Briones. The West End production closed on 27 February 2016 after 760 performances. The cast also performed a "Muck-Up Matinee" on the day of closing, where many understudies came to the stage for one final bow, including Tanya Manalang (Alternate Kim), Christian Rey Marbella (Understudy Engineer), before the main cast in the evening. Cameron Mackintosh announced a cinema screening of the 25th Anniversary Gala along with a movie at a later date, a brand new UK Tour, and plans to transfer to Australia, Germany, and Broadway in the next two years. The revival closed to make way for the London transfer of the Broadway best-selling show Aladdin in May 2016, with former understudy for Thuy, Ethan Le Pong, understudying the lead role of Aladdin. 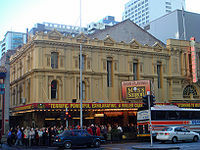 Since its opening in London Miss Saigon was produced in many cities around the world including Stuttgart, Scheveningen, and Toronto, where new theatres were designed specifically to house the show. In the small island community of Bømlo, Norway with only around eleven thousand inhabitants, the show was set up in the outdoor amphitheatre by the local musical fellowship and ran from 5 August to 16 August 2009. The local musical fellowship brought in a Bell Helicopter for the show. According to the Miss Saigon Official Site, Miss Saigon has been performed by twenty-seven companies in twenty-five countries and 246 cities, and it has been translated into twelve different languages. Arlington Virginia's Signature Theatre 2013's production was the US debut with the inclusion of the new song 'Maybe' (which replaced the prior song 'Now That I've Seen Her) which would be integrated into the West End's 2014 revival. After the London production closed in 1999 and also following the closure of the Broadway production in 2001, the show in its original London staging embarked on a long tour of the six largest venues in Britain and Ireland, stopping off in each city for several months. The tour opened at the Palace Theatre, Manchester and also played in the Birmingham Hippodrome, the Mayflower Theatre in Southampton, the Edinburgh Playhouse, the Bristol Hippodrome and The Point Theatre in Dublin. This successful tour drew to a close in 2003 and a brand new production was developed by original producer Cameron Mackintosh on a smaller scale so that the show could be accommodated in smaller theatres. This tour started in July 2004 and ended in June 2006. The first US tour started in Chicago, Illinois in October 1992 and was then expected to travel to those cities that could accommodate the large production. The tour also played venues such as the Wang Center in Boston from 14 July to 12 September 1993, the Broward Center for the Performing Arts, Florida in the Spring 1994, and the Kennedy Center, Washington, DC in June 1994. Cameron Mackintosh said: "Corners haven't been cut. They've been added. There are only a dozen theaters in America where we can do this." A second National US tour launched in Seattle in early 1995 and would close very successfully in August 2000 in Buffalo NY after playing engagements in most major US and Canadian markets, including Honolulu HI, San Francisco, Toronto, and return engagements in Boston (twice), Chicago and West Palm Beach. The tour originally starred DeeDee Magno as Kim (later Kristine Remigio, Kym Hoy, and Mika Nishida), Thom Sesma as The Engineer (later Joseph Anthony Foronda), and Matt Bogart as Chris (replaced by Will Chase, Steven Pasquale, Greg Stone and Will Swenson). This production boasted all the original design and creative elements of Broadway, but on a scale that most major market road houses could accommodate. A non-Equity North American tour began in summer 2002 to spring 2005, playing such venues as the New Jersey Performing Arts Center, Newark, New Jersey in November 2003, Raleigh, North Carolina in February 2005, and Gainesville, Florida in November 2003. A third UK tour for 2017/2018 opened at the Curve in Leicester and will also tour to the Birmingham Hippodrome, the Bord Gáis Energy Theatre in Dublin, the Wales Millennium Centre in Cardiff, the Edinburgh Festival Theatre and the Mayflower Theatre in Southampton. Another US tour began at Providence Performing Arts Center in September 2018. Hubert van Es, a Dutch photojournalist who recorded the most famous image of the fall of Saigon in 1975 (a group of people scaling a ladder to a CIA helicopter on a rooftop), considered legal action when his photograph was used in Miss Saigon. Miss Saigon has received criticism for what some have perceived as its racist or sexist overtones, including protests regarding its portrayal of Asians and women in general. Originally, Pryce and Burns, white actors playing Eurasian/Asian characters, wore eye prostheses and bronzing cream to make themselves look more Asian, which outraged some who drew comparisons to a "minstrel show". In the London production of Miss Saigon, Lea Salonga originally starred as Kim, with Jonathan Pryce as the Engineer. When the production transferred from London to New York City, the Actors' Equity Association (AEA) refused to allow Pryce, a white actor, to recreate the role of the Eurasian pimp in America. As Alan Eisenberg, executive secretary of Actors' Equity explained, "The casting of a Caucasian actor made up to appear Asian is an affront to the Asian community. The casting choice is especially disturbing when the casting of an Asian actor, in the role, would be an important and significant opportunity to break the usual pattern of casting Asians in minor roles." This ruling led to criticism from many, including the British Equity, citing violations of the principles of artistic integrity and freedom. Producer Cameron Mackintosh threatened to cancel the show, despite massive advance ticket sales. Though there had been a large, well-publicised international search among Asian actresses to play Kim, there had been no equivalent search for Asian actors to play the major Asian male roles—specifically, those of the Engineer (Pryce) and Thuy (Keith Burns). However, others pointed out that since the Engineer's character was Eurasian (French-Vietnamese), they argued that Pryce was being discriminated against on the basis that he was Caucasian. Also, Pryce was considered by many in Britain to have "star status," a clause that allows a well-known foreign actor to recreate a role on Broadway without an American casting call. After pressure from Mackintosh, the general public, and many of its own members, Actors' Equity was forced to reverse its decision. Pryce starred alongside Salonga and Willy Falk (as Chris) when the show opened on Broadway. During the production transfer from West End to Broadway, a lesser controversy erupted over Salonga's citizenship, as she was neither British nor American. Salonga is Filipina, and the AEA wanted to give priority to its own members, initially preventing her from reprising her role. However, Mackintosh was unable to find a satisfactory replacement for Salonga despite the extensive auditions that he conducted in several American and Canadian cities. An arbitrator reversed the AEA ruling a month later to allow Salonga to star. Community members have organized against the play in many different cities over the years, citing that the production is racist and misogynistic. 2010 Fulbright Hayes Scholar D Hideo Maruyama states, "it's time to see the real Vietnam, not the Miss Saigon version. Whether or not America is ready to see the real one is up to question." American artist and activist Mai Neng Moua states, "I protested Miss Saigon back in 1994 when the Ordway first brought it to town. I was a college student at St. Olaf and had never protested anything before. I didn't know what to say or do. I was scared people would yell or throw things at me. Then I met Esther Suzuki, a Japanese American woman whose family survived the racist U.S. policy of internment camps. Esther was about my size – which is small – but she was fearless. Esther protested Miss Saigon because, she better than anyone, understood Dr. King's "No one is free until we all are free." I stood with Esther, protesting Miss Saigon, and drew strength from her. We protested Miss Saigon because it was racist, sexist, and offensive to us as Asian Americans. Nineteen years later, this hasn't changed." Vietnamese American activist Denise Huynh recounts her experience attending the production and the stereotypes making her feel physically ill.
Sarah Bellamy, co-artistic director of the Penumbra Theatre, dedicated to African American theater, states "It gets a lot easier to wrap your head around all of this for folks of color when we remember a key point: this work is not for us. It is by, for, and about white people, using people of color, tropical climes, pseudo-cultural costumes and props, violence, tragedy, and the commodification of people and cultures, to reinforce and re-inscribe a narrative about white supremacy and authority." Though the show has received awards and acclaim, it lost the Best Musical Award at the 1989/1990 Laurence Olivier Awards to Return to the Forbidden Planet in London. Upon its Broadway opening in 1991 the musical was massively hyped as the best musical of the year, both critically and commercially. It broke several Broadway records, including a record advance-ticket sales at $24 million, highest priced ticket at $100, and repaying investors in fewer than 39 weeks. Miss Saigon and The Will Rogers Follies led the 1991 Tony Award nominations with eleven nominations. According to The New York Times, "Will Rogers and Miss Saigon had both earned 11 nominations and were considered the front-runners for the Tony as best musical. But many theatre people predicted that Miss Saigon, an import from London, would be the victim of a backlash. There is lingering bitterness against both the huge amount of publicity Miss Saigon has received and the battle by its producer, Cameron Mackintosh, to permit its two foreign stars, Mr. Pryce... and the Filipina actress Lea Salonga, to re-create on Broadway their number one award-winning roles." The show lost to The Will Rogers Follies for nearly every major award, though Lea Salonga, Jonathan Pryce and Hinton Battle all won awards. Cameron Mackintosh reported that the film version of Miss Saigon depended on whether the Les Misérables film was a success. In August 2013, director Lee Daniels announced hopes to get a film adaptation off the ground. On 27 February 2016 at the closing night of the Miss Saigon London Revival, Mackintosh hinted that the film adaptation was close to being produced when he said, "Sooner rather than later, the movie won't just be in my mind". As well as this, the 2014 "25th anniversary" performance of Miss Saigon in London was filmed for an Autumn cinema broadcast. In March 2016, it was reported that Danny Boyle was in talks to direct the film for a 2018 release. Tears of Heaven - Another Vietnam-set musical, from 2011 by composer Frank Wildhorn, set in the lead up to and during the Tet Offensive. ^ a b Hernandez, Ernio (2008-05-28). "Long Runs on Broadway". Celebrity Buzz: Insider Info. Playbill, Inc. Archived from the original on 2009-04-20. Retrieved 2013-09-03. ^ Schönberg, Claude-Michel. "This Photograph was for Alain and I the start of everything...", October 1995. Archived 2011-08-21 at the Wayback Machine Retrieved on 2007-December 15. ^ Miss Saigon at the Internet Broadway DatabaseRetrieved on 2007-December 15. ^ Oliver Oliveros (12 October 2012). "Breaking News: West End Revival of MISS SAIGON to Hold Auditions in Manila, 11/19-22". BroadwayWorld.com. ^ "Miss Saigon gala celebrates 25th anniversary!". cameronmackintosh.com. ^ "Final flight for Miss Saigon". cameronmackintosh.com. 2015-07-14. Retrieved 2015-07-14. ^ "MISS SAIGON The Musical | Official Broadway Site | Cast/Creative". Miss Saigon on Broadway. Retrieved 2017-01-25. ^ "The Heat is On! Miss Saigon Revival Will Bow on Broadway in 2017". Broadway.com. 2015-11-19. Retrieved 2015-11-19. ^ a b "The American Dream! MISS SAIGON Will Land at Original Broadway Home This Spring". Broadwayworld.com. 2016-08-04. Retrieved 2016-08-04. ^ Paul Harris (2013-09-03). "Regional Legit Review: 'Miss Saigon'". Variety. ^ "Photographer who took famous Vietnam war image dies". The Guardian. 15 May 2009. ^ Steinberg, Avi. "Group targets Asian stereotypes in hit musical," Boston Globe, January 2005. Archived 2012-04-30 at the Wayback Machine Retrieved on 2007-December 15. ^ a b c Rothstein, Mervyn (8 August 1990). "Union Bars White in Asian Role; Broadway May Lose 'Miss Saigon". New York Times. Archived from the original on 2012-04-22. ^ Corliss, Richard (20 August 1990). "Will Broadway Miss Saigon?". Time. Archived from the original on 16 October 2007. ^ "Yellowworld Forums - Yellowface Top Ten". Archived from the original on 2013-10-14. Retrieved 15 December 2007. ^ Ito, Robert B. (2 May 2014). ""A Certain Slant": A Brief History of Hollywood Yellowface". Archived from the original on 3 May 2014. ^ Sternfeld, Jessica (2008). "The Megamusical in the 1990s". The Megamusical. Indiana University Press. ^ "THE ORDWAY STILL DOESN'T GET SEXISM AND RACISM (THE PROBLEM WITH MISS SAIGON)". Racialicious. Racialicious. Archived from the original on 2015-09-21. ^ Huynh, Denise. "We All Deserve Better". TC Daily Planet. ^ Bellamy, Sarah. "Establishing Cultural Norms, our Role and Responsibility". TGC Circle. TGC Circle. Archived from the original on 2015-10-03. ^ Gordon, Scott. "A "Miss Saigon" discussion implodes at Overture". Tone Madison. ^ Chappell, Robert. ""We're Not Your Model Minorities." Asian Americans & Allies Gather Outside Madison Arts Center After "Miss Saigon" Discussion Cancelled". Fox Valley News. ^ Laurence Olivier Awards: Past winners - Musical Archived 2007-09-27 at the Wayback Machine Retrieved on 2007-December 15. ^ "Cameron Mackintosh's Plans for Miss Saigon Movie Hinge on the 'Success' of Les Miz". Broadway.com. ^ Movies News Desk (26 September 2012). "Cameron Mackintosh Says MISS SAIGON is Next Musical to Hit Big Screen". broadwayworld.com. ^ Merle Ginsberg & Gary Baum. "'The Butler' Follow-Up: Lee Daniels Says His Janis Joplin Biopic Is Next". The Hollywood Reporter. ^ Broadway World, 28 February 2016. "Miss Saigon team speaks at Final London Performance"
Shimizu, Celine Parreñas (May 2005). "The bind of representation: performing and consuming hypersexuality in Miss Saigon". Theatre Journal. 57 (2): 247–265. doi:10.1353/tj.2005.0079.